Emergency radios are becoming increasingly more important, especially when you consider the extreme weather conditions we experience in the United States. With a good emergency radio, you have access to emergency broadcasts without the need for a working phone, computer, or television. Curious what the best emergency radios are? Discover our top picks today and choose the best emergency radio for your needs! As mentioned briefly in our introduction, the emergency radio is used during emergency weather situations. Therefore, many of the features you will find on emergency radios will be safety related; this includes access to emergency broadcasts, the ability to charge your electronic devices, and more. Below, you can find some of the emergency radios with the best features. Many companies provide the American popular with decent emergency radios, but there are certain brands that stand out head and shoulders above the rest. These brands are Eton and RunningSnail, known for benefits such as durability, versatility, and affordability. Below, we have described each brand in more detail, so you can determine which of these premium brands fit their preferences and needs best. So, read on to determine which brand fits your requirements. Eton is undoubtedly one of the best-known manufacturers of emergency radios in the United States. Some of their emergency radios are even supported and endorsed by the American Red Cross, which makes any Eton emergency radio a good choice during extreme weather. Most Eton emergency radios are known for their durability and versatility, but also for the many additional features Eton radios tend to have. So, the Eton brand is not only a good choice for safety features, but also for those additional features that may make your environment a little better during an emergency. While Eton is known for durable and versatile emergency radios, RunningSnail is known to provide the most affordable emergency radios. Of course, an affordable emergency radio must still be functional, but this is not a problem when you choose an emergency radio from RunningSnail. Despite their lower price, at least compared to other popular emergency radios, the RunningSnail emergency radios score remarkably high on functionality and durability. So, if you cannot afford an Eton, then the RunningSnail emergency radio should be your first alternative. Does not include siren or compass. Consumers looking for the most durable emergency radio will not be disappointed with the Eton Scorpion II, which is considered as one of the most durable emergency radios available today. However, the sturdy construction is not the only reason why you should consider the Eton Scorpion II, since there are other features that make this emergency radio a genuine stand out. When you choose the Eton Scorpion II emergency radio, you will have three options to power your radio. These options are a rechargeable lithium battery, a solar panel, and the hand crank. The Eton Scorpion II also comes with a battery charge indicator, which shows you how much power you have left at any time. As we briefly mentioned already, the Eton Scorpion II comes with some additional features that could prove extra useful in emergency situations. The first is the USB output that comes with this emergency radio; this output can be used to charge your smartphone and other USB-powered electronic devices. In addition to the USB charger, the Eton Scorpion II also comes with a ½ watt LED flashlight. Opposed to flashlights accompanying other emergency radios, the flashlight in the Eton Scorpion II is long-lasting. The Eton Scorpion II also has excellent reception. The emergency radio comes with a digital tuner and a special display; this makes it possible to fine tune your reception if required. So, with the Eton Scorpion II, it is easy to listen to AM, FM, but also the NOAA weather alerts. The Eton FRX5BT is one of the most versatile and functional emergency radios in existence today, so it is only natural it should be added to the overview of best emergency radios. When you choose the Eton FRX5BT emergency radio, you can power your emergency radio with solar power, hand crank, but also the accompanying micro-USB cable. The device is also accompanied by a 2000mAh rechargeable battery; this rechargeable battery gives you enough power to charge one of your electronic devices. Compared to other emergency radios, the Eton FRX5BT has the most advanced and effective hand crank system by far. By cranking the handle for a minimum of two minutes, you will get more than thirteen minutes of power. This is also the best we could find for emergency radios today. Opposed to other emergency radios, the crank handle of the Eton FRX5BT is far superior in design too. The handle is considerably larger than the average emergency radio, which makes it far easier to operate. Consumers who choose the Eton FRX5BT as their preferred emergency radio also receive full Bluetooth functionality. The Bluetooth function allows you to connect the emergency radio to your smartphone. The smartphone can then function as a speaker, which could prove entertainment during power outages. Connecting the smartphone to the emergency radio can also provide you with SAME alerts. The ETON FRX5BT comes with some extra safety and emergency features too. Firstly, the Eton emergency radio has an LED flashlight, which could prove once again useful during power outages. The device also has a red emergency beacon, enabling the consumer to signal for help when required. In addition to that, the Eton FRX5BT also has a dimmable light, which can function as a smaller light source when the power goes out. We must also mention the casing of the Eton FRX5BT, because it is more durable than the average emergency radio. The casing does not only provide extra durability though, since it is drop resistant from a height of 3.3 feet as well as water resistant; this according to the IPX4 standards. Despite the large number of benefits accompanying the Eton FRX5BT, there are some minor disadvantages connected to this emergency radio. Firstly, the emergency radio does not contain a compass, nor provides it an option to use disposable batteries. Other than these minor disadvantages, the Eton FRX5BT is a flawless emergency radio and one of our top picks for emergencies. Consumers looking for the most affordable emergency radio with plenty of features will undoubtedly find it in the RunningSnail MD-090. While the audio quality of this emergency radio is less than the other models mentioned here today, the RunningSnail MD-090 still provides top emergency features as well as extra emergency radio features. When you choose the RunningSnail MD-090, you will get several methods to charge your emergency radio. The RunningSnail MD-090 includes a solar charger, USB charging port, and a disposable battery backup; this ensures that there is a constant supply of power, even during prolonged power outages. In addition to these modern ways to power your emergency radio, the RunningSnail MD-090 also comes with an effective hand crank mechanism. As you know already, the hand crank can be used to get an emergency power supply; this could be an alternative when none of the other available power supplies are available. One of the downsides to this more affordable model of the emergency radio is the analog tuner. Even though you can get the job done with an analog tuner, it does become a little more difficult than if you would use a digital tuner. However, emergency radios that contain such a digital tuner cost considerably more than those with an analog tuner. Other than the problem with the analog tuner, there is not much wrong with the RunningSnail MD-090; this is quite surprising when you consider you can acquire one of these emergency radios for as little as $30. The RunningSnail MD-090 also has astonishing reception, picking up all the big AM and FM radio stations. If we would have to make a small comment, we would say that the audio quality is a little less than the more expensive emergency radios. Still, we cannot complain about audio quality considering the affordable price this emergency radio is sold for. A RunningSnail MD-090 also has many extra features you would only expect to find with the more expensive emergency radios. In addition to the essential emergency features, the RunningSnail MD-090 also contains a phone charger, LED flashlight, reading light, siren, and even an SOS Morse code beacon! When you buy a RunningSnail MD-090, you are also protected against material defects and poor workmanship, since the company provides a warranty for an entire year. The company also provides an excellent customer service, so you can always contact the people at RunningSnail if you encounter a problem. The three emergency radios mentioned today are the best choices on the market today, but with constant developments, it is undoubtedly a good idea to check the latest releases regularly. When checking emergency radios, these are the main features you should consider. 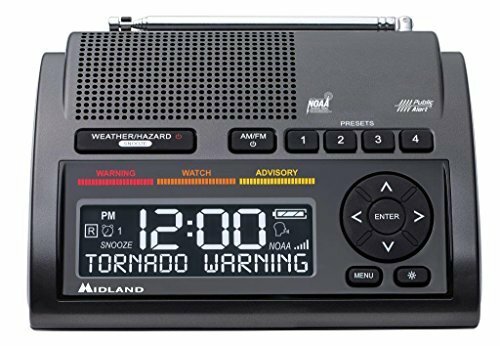 When you are looking to purchase a fully functioning emergency radio, always check if the radio meets the public alert and NOAA NWR All Hazards standards. If the emergency radio meets these criteria, the emergency radio will contain the accompanying stickers or logos. One of the most important things for emergency radios is that they can be charged with various power sources. If your intended emergency radio only has one way of charging it, then it is better to look for another option. Ideally, you want your emergency radio to have at least three possible power sources. Even though additional features can be quite convenient in an emergency, they should never be your primary concern. Before you look at additional features, make sure that your emergency radio has the best safety functions first. When you browse available emergency radios, you will notice that they come with either analog or digital tuning. Even though digital is usually better, there are some emergency radios with an analog tuner that still provide you with maximum functionality. So, instead of looking to the type of tuning, it is best to look at the reception, audio quality, as well as the easiness of the tuning process. Consumers who deal with serious weather conditions on a regular basis, will not get along with the average emergency radios. Instead, they require a more durable option that can withstand factors such as shock, water, and more. Of course, even if your emergency radio is quite durable, it is always recommended to keep your radio protected. Some manufacturers will provide a protective case or sleeve with the radio, which could prove useful to keep your valuable emergency radio protected during its use.